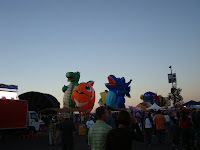 The Albuquerque International Balloon Fiesta. 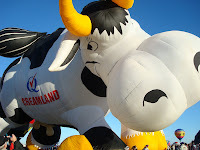 This world renowned event brings balloonists from all over the world, with balloons of all shapes and sizes to this great city to participate in the World's Largest Balloon Fiesta. 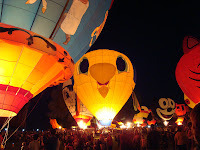 The event is a week and a half long and hosts regular Mass Ascentions, Balloon Glows, Special Shapes Rodeos and Glowdeos (Shaped Balloons that fly in the morning and glow at night), and Balloon Races (hundreds of balloon race into the park to grab envelopes off poles that are 15 ft in the air). If you ever needed an excuse to travel to Albuquerque, this is it. 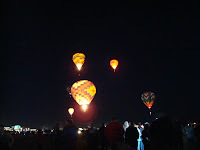 People begin arriving at the park at 5 am and stay all day to see the over 800 balloons take flight. Of course, to get up that early, it requires a lot of coffee, well for me anyway. We woke up at 4:15 to get ready, and by 5:30 I had already had three cups of coffee. And what goes best with coffee? awww....i was wondering when the balloon fiesta was happening - rats! we're coming to santa fe in a couple of weeks to celebrate my birthday, flying into ABQ, and i'd hoped we'd be lucky. ah well. it really is special. and your biscotti look wonderful! 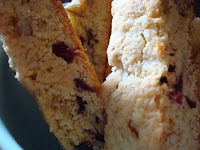 lovely biscotti--good early morning fortification! 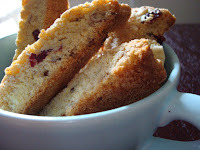 Your biscotti look adorable! The cranberries were a great idea! 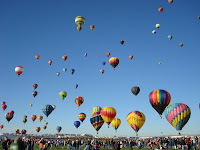 Haha - I totally want to see a balloon fiesta, it looks too cool. 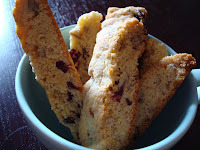 And yes, biscotti go wonderfully with coffee, especially at such an early hour. yum, cranberry pecan. That sounds great and your biscotti look perfect. Cranberry and pecan sound delicious together. That Hot Air Balloon festival looks like fun! How lucky you are to live in a city that has such a wonderful festival! And what good luck that the biscotti recipe came during balloon week! Glad you enjoyed them both! Your biscotti looks fabulous and the balloon pictures are awesome! cranberry pecan...sounds like one of my versions...I am sure they were tasty! Can't think of a better reason to have biscotti at that hour. Way to go. They look delicious.